Barcelona transforms into a smart city by introducing smart digital services that integrate new technologies and upgrade some of the city’s existing services and resources. Barcelona is becoming a sustainable, tech-driven and self-sufficient city by expanding its capacity to meet the needs of the citizens. As a result of the BCN Smart City project, the City Council has developed solutions that provision smart digital services enabled by a connection to the Wi-Fi infrastructure. Some of these services include self-regulating street lighting, sensors measuring air quality and noise, smart parking, apps for discovering real-time events, smart bus stops and public Wi-Fi hotspots. Thanks to the Barcelona’s strategy of long-term urban transformation, the city’s services and resources are becoming easily manageable through innovative apps, new technologies, open data, and wireless connectivity. The Barcelona City Council plans to increase resident’s access to the Internet and has already installed 1,500 Wi-Fi hotspots across the city. Thus far, Wi-Fi connectivity has been extended to 276 street sites, 193 municipal facilities, 220 municipal parks and several gardens. 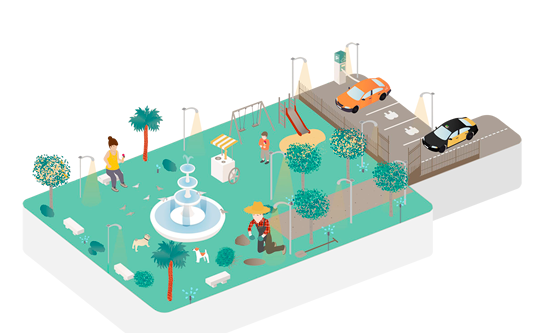 Furthermore, the BCN council also plans to introduce a work out a plan for Wi-Fi services in public spaces, aiming to increase the network by 1.520 new hotspots. By the end of 2016, approximately 1,000 buses and 16 metro stations will be equipped with a Wi-Fi service. The City Council and the Catalan Government have allocated 90 Million Euros to boost investments, encourage innovation and assist Barcelona’s successful transformation into a smart city, where open information is available in real-time, where services and resources are efficiently managed and where new technologies play major role in fostering both personal and business development. Tanaza Wi-Fi cloud management is now being used to deploy Smart Wi-Fi in public spaces. Download our smart cities case study and learn how Tanaza Authorized Partner, Tacira Technologies, is intergrating smart services by way of the Tanaza solution.